A popular but perilous lookout over Edmonton’s river valley is getting a facelift and a new name. 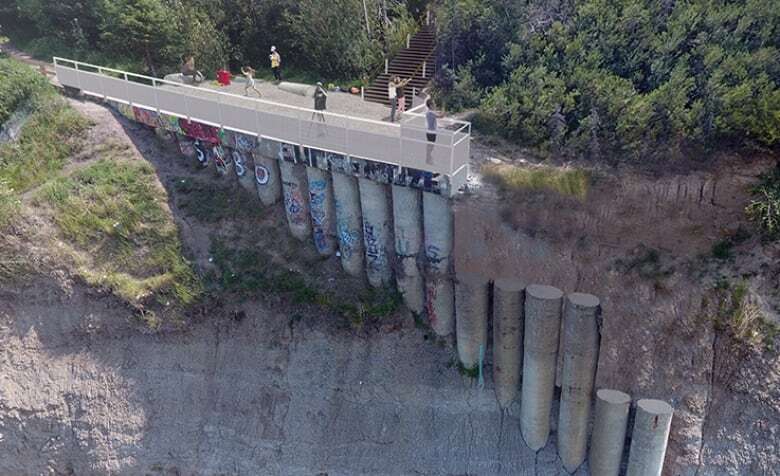 A set of stairs will cover a steep, dirt slope that leads to what is locally called the End of the World off Saskatchewan Drive near 74th Avenue. A railing will go up along the concrete wall at the top of the river bank. The city launched the $1.5-million project at the site Monday. Roger Laing with the Belgravia Community League has been working with the city since 2015 on a plan to make the area safer and more accessible. Though it has been designated a prohibited site people still venture down despite “no trespassing” signs. The picturesque spot attracts a variety of sightseers, including people who party and leave garbage. Laing said there have been accidents. The End of the World will also have a new name: it’s now officially called Keillor Point Viewing Area. Laing, also the chair of the Keillor Point committee, said he is comfortable with the name chosen by the City of Edmonton naming committee. The lookout is the product of the former Keillor Road, which closed in the mid-1990s. Aaron Lewicki, a city director, said the project includes removing some of the exposed columns facing the river, which used to be part of Keillor Road. Keillor Point will also get a trail and landscaping in spring 2019. Lewicki said the city will monitor the slope during and after construction to make sure it remains safe. The project will cost $1.5 million and includes design, public engagement sessions and construction.